If you accept this premise, then you need to take a look at conversation marketing. Conversation marketing is the practice of asking targeted questions to customers through digital channels, enabling those customers to segment themselves with their answers, and automatically formulating an appropriate offer based on those answers; in real-time. It's like search marketing in reverse. If I search "buy a Ford,"
Then, I'm in the "Ford buyer" segment. "Are you buying a car?" If "Yes", Ask, "New or Used?" If "Used", Ask "Paying cash or financing?" If "Financing" then I'm in the "In-Market Used Car Loan" segment. Conversation marketing, though typically deployed through service channels, is outbound marketing in contrast to search marketing, which is inbound marketing. Conversation marketing is therefore competing for digital real-estate with other outbound marketing techniques, primarily banner ads, both targeted and untargeted. Let's assume, for the purposes of this comparison, that we are replacing targeted banner ads with conversations. In the case of a banner ad, after she clicks on it, she has to wait a few seconds for the landing page to load. She now needs to read the landing page content, then decide whether she wants to apply for the auto loan. 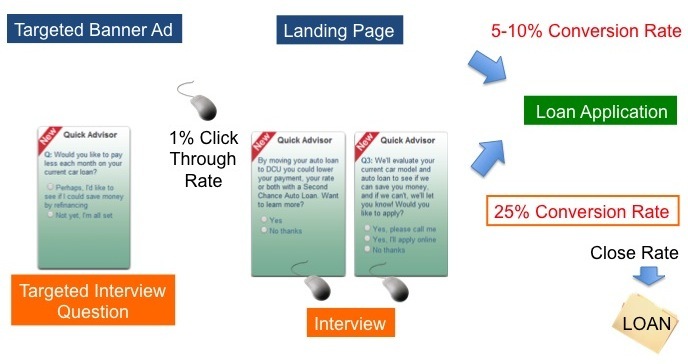 5-10% of landing page visits from banner ads typically convert into leads. In the case of a conversation, after she answers the first question, she doesn't have to wait for a new page to load, she simply answers 2 more questions in about 8 seconds and then decides whether or not to accept the offer to apply for a loan, talk to a loan officer, or get more information. We consistently see 25% conversion of interviews to warm leads or referrals. That's a 2.5 - 5X productivity advantage over targeted banner ads. What's behind the productivity advantage? First, that 1- to 4-second landing page load time* is just process overhead in the case of the banner ad path. That time is used in the conversation process to gain additional information from the user for the purpose of tailoring an offer. Second, the conversation process fundamentally segments exponentially, meaning that each additional answer the user provides yields a lot more information about which offer to make to her. The number of segments the conversation process produces equals the number of possible answers to each question to the power of the number of questions asked. So, for example, if you ask a friend 3 questions with 2 possible answers to each question, you will find 2 to the power of 3, or 8 possible segments into which your friend will fall. Segmentation works in marketing—that's not in dispute. So, if you want to want to make it easier for your customers to buy from you, cut their overhead and listen better with conversation marketing; your customers and revenue line will be happy you did.